Kameyama Casting manufactures various products ranging from automobile parts to jet plane parts for domestic and overseas customers. Our goal is to “manufacture high-quality products at low cost and in a short period of time” for our customers. By establishing a coherent production system from design to casting and transport for delivery, we have overcome three hurdles described above. We have realized ideal manufacturing. 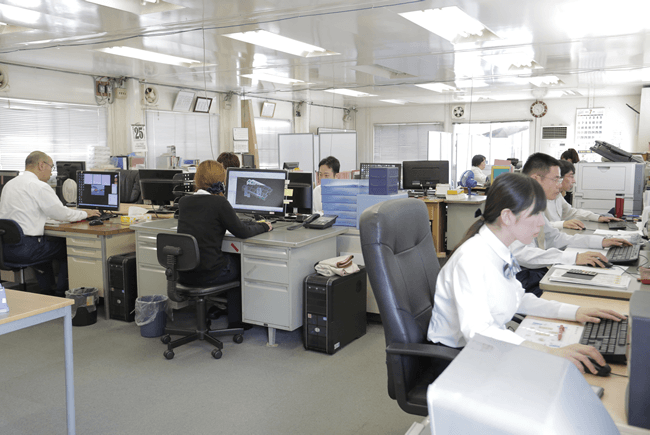 Kameyama Casting, a casting company was established in 1946. The company manufactures various products ranging from parts of automobiles to parts of liquid crystal devices and jet planes for domestic and overseas customers. At the time of establishment, Kameyama Casting manufactured general casting products. In 1982, the company entered into the field of full mold casting of press molds for automobiles. Today automobile-related parts account for about 80% of our sales. Since an automobile consists of various parts, delayed delivery of one part results in stop of the production line. In order to avoid such risk, we promise our customers quick delivery of ordered products wherever possible. You may worry about the quality of products delivered in a short period of time. There is no need to worry. The big advantage of Kameyama Casting is technologies accumulated from the time of establishment. In particular, we introduced 3D CAD/CAM in 2002 and total of 16 technical experts (10 Japanese experts and 6 foreign experts) are engaged in the operation whose scale and quality are top level in the industry. Furthermore, in order to produce high-quality casting, we adjust ingredients at the element level. While we have promoted mechanization in order to prevent human error, we keep visual check by human for some processes. “Our product quality” is created from our special focus on quality control. Kameyama Casting offers low cost through our business efforts with the best of intentions. 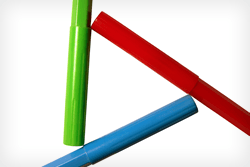 The secret of the low price lies in our integrated in-house manufacturing system. Since the whole processes from design of sample molds using 3D CAD/CAM to manufacturing of castings are implemented in our plant, commission fees and intermediary margins are not required different from the case where some process are entrusted to other companies. 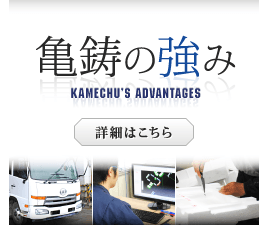 Kameyama Casting manufactures automobile parts, general castings, etc. Having adopted the full mold casting process using Styrofoam patterns, not commonly-used wooden patterns, the company has achieved manufacturing at low cost and in a short period of time. Molds are designed by 3D CAD/CAM, sample molds are simulated using a PC, and our CAD operators with top level scale and skill in the industry draw any complicating designs without problems. In addition, we manufacture a uniquely developed machine tool named “Kame-cap” and other castings which serve as backbone of manufacturing in Japan, including mass production mold castings, molding boards, and large cast iron surface plates. copyright(c)2014 Kameyama Casting Co.,Ltd. All Rights Reserved.